Add the beer, water, Clam Base, potatoes, garlic, lemons, onions, crab seasoning bag, Cajun seasoning and corn to a 16-quart stock pot. Bring the mixture to a boil, reduce the heat and simmer for 15 minutes. 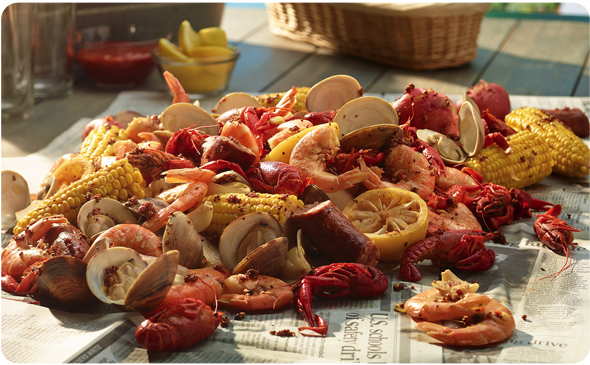 Add the sausage, shrimp and crawfish (optional) to the pot, stir, cover and steam for 2 -3 minutes. Remove the clams from the ice water and add the clams to the pot, stir, cover and cook for 4 - 5 minutes or until the clams have opened. Use a large slotted spoon to carefully remove all of the ingredients to a large platter and serve immediately with cocktail sauce.